Indebted Canadians pay at least $24 million a year for what is often unnecessary debt advice. How does this happen? Well, when you have overwhelming debt, you’re not just thinking about the money. There’s also an emotional element: You’re stressed, anxious, and worried about your future. Enter unlicensed debt consultants. They know that you fear going bankrupt, or even talking with a bankruptcy trustee. They take advantage of your vulnerability and offer you a comforting sales pitch about how they can get you a better plan to eliminate your debt. In the end, they do nothing except refer you to a Licensed Insolvency Trustee for a consumer proposal. But before they do, they also have you sign a contract to pay them thousands of dollars in fees for that referral. On today’s podcast, we get some insight from our special guest who experienced this exact scenario and explain how you can avoid falling into this same trap. Licensed Insolvency Trustees (LIT): The only professionals licensed by the Government of Canada to administer personal bankruptcies and consumer proposals. However, trustees don’t just offer these solutions. As government regulated credit counsellors, our job is to explain all of your options so you can choose the best way out of debt for your circumstances. Credit Counsellors: These are typically not-for-profit agencies and there are two types – small companies and national agencies. The small, local companies have accredited counsellors who will meet with you in person and offer you budgeting tips and money management advice, as well as, sometimes recommend a debt management plan. The larger organizations, on the other hand, operate as call centres, where you rarely meet with a counsellor in person and their primary business is to put you into a debt management plan. Debt Advisors: Also known as debt consultants. They act as middle-men between the debtor and a Licensed Insolvency Trustee. They charge a fee for their referral and are able to exist because their practice isn’t illegal in Canada. They market themselves using warm language to prey on emotional debtors. The thing is, you do NOT need to be referred to a Licensed Insolvency Trustee. You can meet with one directly for a free, no-obligation consultation. And debt consultants can rarely get you a better proposal deal, regardless of what they say, and certainly not save you enough to warrant their high fees. Hoyes, Michalos does not have a relationship with these types of debt consultants. We are in fact advocating with the government to find ways to prevent what we consider to be abuse of already stressed out debtors and take every opportunity we can to make consumers aware of the pitfalls of dealing with a debt consultant. In fact, most Licensed Insolvency Trustees do not support these debt consultants. In their review, the government found that only 50 LITs of more than 1,000 across Canada were found to commonly deal with unlicensed debt consultants. Our guest on today’s show, who agreed to be on the podcast but would like to remain anonymous, had $45,000 in unsecured debt. Knowing that he could not trust banks to help him and worried that he would only face bankruptcy by going to an LIT directly, he opted to work with an unlicensed debt consultant. He fell victim to one of their many warm sales pitches on Facebook. He even tried to be cautious and explored their website. The ad appeared legitimate and had a very inviting and friendly tone. With website copy like, “we’re on your side”, unlicensed debt consultants market themselves as consumer advocates. They don’t make it obvious that they’re only middlemen and they do not disclose their fees. When you’re indebted and worried, their service appears as a sign of hope and relief. Unfortunately, that is not what actually takes place. Our guest only met with his debt consultant twice. Once to established how much he owed in fees to the consultant and the payment schedule and gather some info. And the second time to be referred to the Licensed Insolvency Trustee. So I met – the first time was all the info. And then we did work out the pricing, I believe, then. The second time, was actually when we met the trustee. So we had to email back and forth. I was asking about updates. I would like an update, what’s going on? And I kept having to harp on the person. And then eventually he brought his trustee in from wherever. The consultant didn’t even do much in terms of the proposal process. These documents were prepared by the trustee. And the documents were already created in a separate folder from the trustee itself. So I already had my one folder from this one consulting company, which was pretty thin. It just had the giant payment schedule and some services rendered. And then the big one from the trustee. Our guest was charged $2,000 for this so-called service that the debt consultant provided, in which they did absolutely nothing. The sad part is that our guest’s situation is quite common. Canadians pay unlicensed debt consultants for their referral services almost 10,000 times a year, according to a 2017 report by the Office of the Superintendent of Bankruptcy (OSB). Know who you’re dealing with. You should always work directly with the type of advisor that provides the service you need. If you are thinking of filing a consumer proposal, work directly with a Licensed Insolvency Trustee. Skip the middleman. Ask for their credentials. If a debt consultant tells you they’re not the actual Licensed Insolvency Trustee, take this as a red flag, don’t sign any paperwork and don’t make any payments before your proposal is filed with the government. Know what you’re paying for. A debt consultant provides no real service, yet charges a ridiculous fee. Ask yourself, “Why am I paying this? Did they do anything for me?” This should help you determine whether or not it’s really for your benefit. 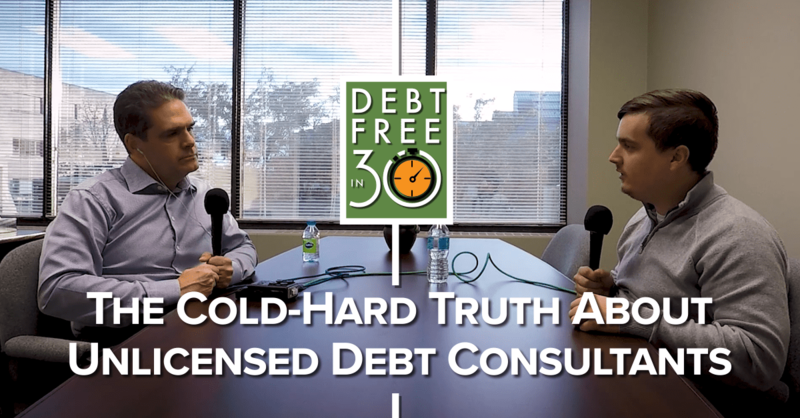 For more detailed information on how unlicensed debt consultants persuade their customers to go to them for debt help and how to avoid their tricks, tune in to today’s podcast or read the complete transcription below. Doug Hoyes: For the first time ever here on Debt Free in 30, on today’s show I interview a guy who went to an unlicensed debt consultant, paid them a lot of money and only later did he realize that all they did was refer him to a licensed insolvency trustee to file a consumer proposal. He paid a lot of money for nothing. According to a government report this happens almost 10,000 times a year and Canadians are paying almost $24 million a year for nothing more than a referral instead of paying no upfront fee and going directly to an LIT. So why does this happen? Well, struggling with debt is not only about money, it’s about emotional turmoil. Every day I talk with people who are dealing with significant stress because they can’t pay their bills. They’re getting constant calls from collection agents or they may have a wage garnishment. They’re overwhelmed with the struggle to keep up with debt payments and still have enough money left over for rent, groceries and everyday living expenses. When they finally reach the breaking point and decide to find help, they’re desperate. They want to find someone who’ll help them and explain their options in easy to understand language. They want good debt advice and they want to talk with someone who won’t judge them. They also fear the unknown, what will it cost, what will my life be like afterward and will I ever be able to credit again. Now, as a listener to this podcast you may think, “Well, that’s easy, only an LIT licensed by the federal government to do bankruptcies and consumer proposals and so by law they can’t charge an upfront fee, so just go talk to them.” Well, I agree but if you’ve never had debt problems before you may be worried that the LIT will suggest bankruptcy and you don’t want to do that so you look for other options. Unfortunately this makes people with debt vulnerable to a good sales pitch from unlicensed, unregulated, unqualified debt consultants and with total household debt in Canada now at almost $2.2 trillion I’m here to tell you consumer debt relief is a big industry in Canada. There are many different types of debt advisors offering debt advice across Canada, some accredited, some not, some good, some bad. Well, no one solution is right for everyone, unfortunately there are advisors who are leaving their clients worse off. Today we’re going to give you a very quick overview about who offers debt relief advice in Canada and we’re going to spend most of the show showing you what can happen if you get bad debt advice. We’ll close the show with our advice on how to find a good debt advisor. I have Ted Michalos here in the Debt Free in 30 studio to discuss the big picture and I also have a very special guest who actually used a debt consultant and ended up paying more than they should have so you’ll want to stay tuned to hear his story coming up shortly. So let’s set the stage with an explanation of the three big players in the debt advice business. So, Ted, first and most obvious, are licensed insolvency trustees. I think most of our listeners have a good understanding of what we do but let’s start with the 30-second explanation of what does an LIT do. Ted Michalos: Right, so the LITs are the only professionals licensed by the federal government to administer personal bankruptcies or consumer proposals, so those are the legal options to deal with your debts, their role is to explain to you all of your alternatives. So an LIT isn’t going to sit down and say, “You know, you’ve got to file bankruptcy” in fact, that’s the last option they’re going to discuss. They’re going look at each of your options so that you get an informed decision, you can make the right choice for you. Doug: Okay, so that’s pretty simple. So, the next category would be credit counsellors, so what do they do? Ted: Well so, there’s a little confusion here. Credit counsellors for the most part work for not-for-profit agencies and so they are trained to assist you with budgeting and how to provide relief of your debts, a better money management plan. Now the term is also used by some less reputable people that aren’t licensed but I don’t think that’s what you want to talk about today. Doug: No, and we don’t have time to get into a, the whole details but, I mean, there are kind of the big ones and the little ones. Doug: The local ones are great because you can go in, meet with them, they help you with your budget. Ted: If you can still find a local one. Doug: And that’s the problem. Doug: You just, you just can’t find them anymore because they’ve all been swallowed up by the, the big ones, you know, the call centres and so on. So, and over the years you and I have dealt with many credit counselling agencies, in fact we’ve got six current people on our team who – including one of our trustees – who were credit counsellors working for not-for-profit credit counselling agencies in the past. Doug: So, obviously we’re very supportive of the work they do. You and I are less a big fan of the call centres where there’s, you know, no in-person meetings and it’s all done over the phone and all the rest of it. Doug: But, again, we’ll, we’ll talk about that on another show. So, so the final category of debt advisors is what you and I call debt consultants, that’s just a name we’ve made up. Doug: So, so who are they and what do they do? Ted: Well so, for the most part they’re, I mean, they’re not regulated in any way, there’s no official definition of what a debt consultant is, as you said it’s a term that we made up, they could have any sort of background. The important consideration is that they, they’ll charge you a fee and effectively in most cases refer you to a licensed LIT to actually solve the problem. Doug: And as you said at the beginning only an LIT can do a consumer proposal or a personal bankruptcy. Doug: So why is it then if there’s only one service provider that can actually do that kind of work, why are there so many of these other providers and specifically why is it these debt consultants exist? Ted: Yeah, well each group responds to a different need and to a different piece of the market. There are folks, as you said, that are simply, they’re afraid of the whole concept of dealing with a licensed insolvency trustee. They think well the first thing the trustee is going to do is tell me I got to file bankruptcy and that’s not what they want to do. The myth, of course, is that – or sorry, the truth is that very few people actually end up being referred to a trustee to file bankruptcy, it’s the solution we use when none of the others will actually work. But that being said, the reason those other professionals exist is because they’re responding to a different type of person, a different need. And the way that they answer the question is different than the way you and I are required to answer the question. Doug: Yeah, sometimes they don’t have to be fully forthcoming with the, all of the implications, so. Doug: Yeah, so they actually use that as a, a good thing. Doug: Hey, I don’t have to follow any specific rules, I can just, you know, tell you whatever I want to tell you. Doug: So, yeah, I mean, there’s, there’s lots of money to be made and that’s why these U.S.-style call centres have now come up to Canada and of course with the government changing the rules – which again we don’t have the time to get into in detail here, but that’s caused some changes. And then of course, you know, the internet is, is great cause it’s, all the information is out there. Ted: Right, if you know how to use it. Doug: Right. And so these people can then do a lot of advertising and find people even though they may not have a whole lot in the way of, you know, actual bricks and mortar locations or whatever. Doug: So okay, so let’s get into the good stuff here. A while ago I published an article on hoyes.com titled, “Please Don’t Pay for Consumer Proposal Representation.” And shortly after that article was posted we got a message on our Hoyes Michalos Facebook account from a guy who said he used a debt consultant and he wasn’t sure if he got a good deal or not, he wanted me to check it out. Doug: Now, the debt consultant he used wasn’t the same company we mentioned in the blog post and I’m not going to tell you what company it was cause it’s not that, that’s not the point. Doug: There’s lots of them out there. The point of today’s show is to give everyone listening today an insider’s view of how these debt consultants operate so you’re now going to hear how it actually happens. Doug: First time this has ever happened on this show. Now this guy had around $45,000 in unsecured debt, so credit cards and a bank loan, he didn’t have any mortgages or car loan but he was not making great money at his job and he was getting behind so he wanted help. So, let’s play the interview. I started by asking him how did he look for help. Respondent: So you start seeing these Facebook ads, and I don’t know how Facebook is doing it these days with targeting these things, but I was Googling different consultants, trustees, I was trying to figure out what that heck I’d do to get started. And then the one that kept popping up on my Facebook page, one that just kept popping up, looked very, very friendly and approachable and you know, we’re on your team, we’re on your side. And so I just did the, you know, send message link, even – I think it was through Facebook. And that started a whole process after that. Respondent: It’s one of the bigger ones. Doug Hoyes: It’s some big company. So why did you – so you reached out to them and they were friendly and you – I mean did you check them out? Did you go to their website? Respondent: Yeah, their website looked fantastic. It looked like they were kind of the best of everything. They were counsellors, they could get your proposals through and they were on your side. They were on the consumer side, not sort of the middle man, so you want to go for something like that if you feel like you need a consumer advocate, especially when you’re down at your lowest level when it comes to credit and you’re wiped out and you just need a resolution. You want somebody’s going to be on your side, you don’t – because you’re distrusting already of the credit card companies. And so they pop up and you know, going in I knew a lot already about the process because I talked to certain people and things just to find out what options are there. I just needed to find somebody to get the options through and get me the best possible outcome. Respondent: Just had some back and forth. It was – the emails seemed very light. They were just essentially, yeah, come on, here’s an example of what we can do. Here’s an example of somebody we’ve helped and here’s an example of a debt reduction that we’ve had. I’m thinking this is a no-brainer. I’m also thinking, there can’t be a cost. Or maybe there is a low cost, because I don’t know what this company really does. But man, they’re going to get it down that low, and he’s so friendly and super nice. So I go for it. Doug Hoyes: And so you went in for your first meeting with them and that’s where they gather the information, who do you owe money to. Is that how it works? Respondent: Yeah, so I brought – I came prepared, I brought in my statements, I knew that certain cards I’ve already cancelled but we’re still paying. Certain cards were still active. And I came in with all my ducks in a row really. I provided the statements. So it was very easy for them to just take the balance, take the credit name, give them my driver’s licence information so they have my address. Doug Hoyes: And how many meetings did you have with them? Respondent: I believe it was only two until I started meeting with the other trustee people – actual trustee people. Doug Hoyes: Okay. So you met with them, gave them some information, came back, gave them some more information, and then at what point did it become clear that there was going to be somebody else involved. There was going to be a trustee involved in this. Respondent: Essentially, in both meetings they mentioned, oh yeah, we’ll find somebody to put this through. And then they did say they weren’t trustees. But again I’m thinking, well it’s a – it’s maybe a service, it’s a coaching service. Maybe they have a really great trustee, I don’t know, in their back pocket. And again, in the back of my mind I’m thinking, it’s not going to cost me that much because I’m already in debt and I’m thinking, I just need a resolution. I’m willing to pay something, I suppose, if they make it easier, they get me that hidden deal or the hidden best trustee in the world. But you know. Doug Hoyes: So at the end of the second meeting, what happens next? Respondent: Essentially – the first meeting he took the information, the second meeting he showed me what he was going to ask for, or what he was going to send – he said basically what I could offer, essentially. And then you know, I had signed off on payment schedules and things to him, which – should I mention. Doug Hoyes: Well yes. I’d like to hear about that. Respondent: So they said that, oh, it’s a service, it’s based on, you know, your amount of debt, but we’re work out a great – we’ll get a deal for you, or a better deal. And so he’s in his computer, he’s in his computer and then he’s, like, scrolling down and he’s messing with the numbers and it comes up to about two grand. And I’m thinking in my head, whoa, whoa, whoa. Thinking in my head, whoa, that’s insane. Like maybe that’s my debt plus – or subtracted from that or something like that. But no. Then it became, it’s okay, we’re going to make it work, going to do 300, 300, 300 and then a hundred dollars perpetually until it’s paid off including the taxes. And you just pay that to me, but you don’t have to worry about that. I’m going to get started on your file, which you would think is a lot of work and that’s why he’s doing me a solid here. But I had to pay him 300, then the 300, then the three – so the brunt of the $2,000 up front. And he was working on the file. Doug Hoyes: At what point did you meet the trustee then? So you had paid $300 and then you met with the trustee? Respondent: So I met – the first time was all the info. And then we did work out the pricing, I believe, then. The second time, I believe, was actually when we met the trustee, yeah. So we had to email back and forth just I was asking about updates. I would like an update, what’s going on? What’s going on? And I kept having to harp on the person. And then eventually he brought his trustee in from wherever. And the documents were already created in a separate folder from the trustee itself. So I already had my one folder from this consulting company, which was pretty thin. It just had the giant payment schedule and some services rendered, I suppose. And then the big one from the trustee. Doug Hoyes: And so you went in to see the trustee, signed a consumer proposal. Respondent: Multiple pages – no writing from the consultancy whatsoever. It was a completely separate organization. Completely licensed. Doug Hoyes: All done by the trustee. Respondent: Signing, signing, signing, signing, signing, signing, signing, signing, signing. Doug Hoyes: And the proposal ended up being accepted by your creditors. Doug Hoyes: It’s up and running. You’re – that’s all working fine. Doug Hoyes: And it’s – you know, not my firm you’re dealing with. It’s somebody else. You had reached out to me over Facebook, that’s how we got together. Respondent: Yeah, I wanted you to see what I had gone through because I know that you do talk about this stuff. Doug Hoyes: – you’re not one of our clients. Never – anything. So you filed the proposal. You had already made one $300 payment to the debt consultant. You filed the proposal, but then your contract said, well you’ve got to keep making these other payments. Respondent: Yeah, so I was still waiting for the proposal to be accepted. I kept emailing my consultant for updates, when I guess I could have been emailing the trustee about updates, about how long it takes. And then the voting and all that stuff. But yeah, I wasn’t making 300 and this is through the summer, so 300, so that’s a big bang out of my pocket. I’m already – they said, oh, it’s okay, but you can stop paying your creditors, which I guess is one way you can technically do it once the proposal’s through, so I just offset it. I didn’t think about it, right? Because normally you’d be like, that’s a huge hit. But if he says I don’t have to pay the minimum payments, great, I’ll just pay minimum payments, and just pay his giant fee for the three months. Doug Hoyes: So it really wasn’t costing you anything, because well, I would have been paying the creditors anyway. Respondent: So it’s an interesting – I guess it’s an interesting sales tactic, in that – you know you could stop that, so if you paid 400 or 500 a month in minimums, just pay me the three, three, three once we get it through. Now you’re paying – you’re still paying him something, I think it’s a hundred a month. And then the licenced solvency trustee you pay them the settlement or whatever. Doug Hoyes: Yeah. So your proposal that ended up being agreed to by the creditors was $100 a month for five years. Respondent: To pay it off. I wanted to pay something. I didn’t want to go whole hog bankruptcy. I know that works for some people but I knew that I have the capability of paying something. I just could not – never pay the amount that I had because unfortunately just the way the jobs are and even where I’m at now, which is a better work, it’s still probably not enough to pay off $50,000 or $40,000 in debt. Doug Hoyes: And that’s the kind of dollars we were talking about, it was like $45,000 or something in unsecured debt. Doug Hoyes: You know, basically banks, credit cards. Nothing unusual. So I just want to make sure we’re absolutely clear then on how the fees work. So you paid $300 to the debt consultant, the proposal was filed and then because you had this deal to pay them 24, 25 hundred bucks, you paid another 300 and then another 300 and then went on a hundred dollar a month payment plan until the full amount was paid. Respondent: And part of the whole talk was, yeah, it will take a little while for your proposal, so again, you’re not paying those minimum payments. And then by the time your proposal goes through, if it’s a hundred dollars or maybe they reject it and it goes up higher, then you’ll be down to my hundred dollar amount. So it was like, there’s so many moving parts when it comes to the amounts that the process is I’m saving on the minimum payments, and then he’s got a proposal at a hundred, so his fee goes from 300 to 100 and it’s a $200 wash. It’s easy. So, for me, I started getting really skeptical, especially in the early fall. And I looked at this and I talked to family and I talked to friends and they’re like, what did you do? What did you do? I’m like – I – uh, it’s hard to say. Doug Hoyes: You’re still not quite sure what you did. Respondent: Not quite sure. I felt good at the beginning. Because it’s that first meeting, I’m on your side, Team You. But then in reality when you look at the nitty gritty of paperwork and legal side of things you feel kind of taken advantage of because in the end, after the proposal’s filed you really don’t hear from them. Aside from the counselling sessions, but those are mandatory through the trustees anyway. Doug Hoyes: And so did you – and you’re right, in every consumer proposal there are two counselling sessions that are required. Did you go back to the debt consultant for those two sessions? Respondent: I went to their office. They had some other counsellor, I don’t know where they’re from but they came in and sat and did it. Doug Hoyes: Got you. So it was the debt consultant who arranged the counselling sessions. Respondent: Or maybe – I don’t know, maybe it was the trustee. Respondent: I don’t know who arranged it. I just showed up to be honest. Doug Hoyes: Okay. You didn’t show up to the office of the trustee. Doug Hoyes: You showed up to the office of the debt consultant. Doug Hoyes: And the deal that was made – I mean we already talked about that, the $100 a month, so that seems somewhat reasonable. At what point did you say, hey wait a minute. Why am I paying this debt consultant once the proposal’s already up and running? Respondent: Yeah, I was thinking – that’s in the early fall because it was – all right I made the three giant chunks, which sucked because it kind of wrecked my summer because it was a big expense and my hours are kind of poor in the summer. And then I’m still paying – I’m paying the $100 proposal which is totally 100 percent acceptable. And fine, I’m glad it was at 400 – or sorry, $100. But then I’m still paying this fee and I’m looking at the payment schedule and I’m like, I’m going to pay it until next summer, next fall. And I’m like, but I’m not – I don’t hear from this person. They still say they’re happy they don’t do business with me and that’s great. That’s fine I suppose. But I’m not getting really anything from that. Respondent: Yeah, I worked – got into a little bit of a back and forth and I said, look, this is crazy. And they still said that they did a great job and that they – they don’t think that proposal would have been a hundred dollars, but after discussing it with you and just looking at the facts of the matter, like, it might have been accepted at a hundred just based on my financial situation. And even if it was 150, like let’s say it was $150 or $160, I was still paying him a hundred for a nice long period of time. So the savings would probably have not been realized by that much. Even if I saved, I don’t know, two grand over all, I would have paid him two grand. So it’s kind of a wash that way. Doug Hoyes: It just didn’t seem like a good deal to you. Now how much time did you spend with the actual trustee then? Respondent: Just signing the paperwork in the office. Doug Hoyes: So half an hour or whatever. Respondent: I never met the trustee before they showed up and I signed a bunch of documents and that was it. I did email back and forth just with questions on how do I pay it off sooner? How do I find out what it’s at? Because I like to keep track of these things. But I had emailed back and forth with that association or agency, whatever it is. But that’s it. That’s the only interaction. Respondent: And even then, if you look at the interactions as a whole, it was like one decent one-hour session with him, half an hour, 45 minutes with the trustee later, and then a consultant – or sorry, a counsellor for 15 minutes and I didn’t really get- I mean I got it was like three different hands of the same process which just seems a little off. Doug Hoyes: So upfront, when you reached out to the debt consultant and you had done some research and whatnot. Respondent: Just so I knew what options are out there for people who go bankrupt or – I thought maybe going there I might get a fifth option or something, thinking maybe I don’t have to a proposal or bankruptcy at all. So that was part of the idea, but of course there is no service outside of that really. Respondent: Of course I thought this was the be-all, end-all, it’s a flashy website, it’s a flashy service they have apparently. Appears no fee or appears low fee. And maybe there’s a fifth option. Because they always say, we go over every option out there. But in reality when you look at it and after talking even with these a little bit and just googling there’s really only, like, three, maybe four options depending on your situation. I don’t have a house or a mortgage so there’s nothing I can leverage. But it’s proposals, bankruptcy, maybe it’s debt management but there’s really no savings, so it’s tough because you think there’s a fifth option out there, and there’s totally not. So if people are watching this or listening to this and I wanted to have you on to actually walk through how it worked, what advice would you give people? So upfront, how – knowing what you know now, how could you have not done what you did? I mean it sounds like everything you did made perfect sense. You saw the ad, you didn’t just instantly accept it. You went to their website you checked them out. It all seemed legit. Respondent: The only way to avoid something like this, especially because this wasn’t the only one that was on the Facebook feed or the web advertising, but is probably a flashy big giant ones that say they’re powerful Canada-wide. There’s really no – there’s no any regulation or block from it where it says, you know, even if it was on a website for Canada.com and they said please do not – like, when it comes to Canadians’ finances, do not use these services, it’s the same thing they do when it comes to immigration consultants, they say do not use an immigration consultant. There’s a direct way or proper way to do things. In this case there doesn’t seem to be any of that out there. So it’s kind of a Wild West. And I know I was talking to you prior and I’ve used the word predatory and I don’t know if that’s PC but it just seems like it’s an unnecessary middleman and you’re paying so much more because you think, maybe 50 bucks or a hundred dollar consulting fee and I’ll feel great and they’ll help me out. Because I don’t think the amount of time it takes them justifies the amount – the $2,000 they charge. But there’s a minimal in there that doesn’t need to be there. Doug Hoyes: So if their fee had been a couple of hundred bucks, you’re fine with it. Respondent: I mean I probably would have had this conversation, because the proposal went through at $100 from the trustee side, which was great for me, because it was a reduction and that was money and it would probably came and went and I wouldn’t have to continuously pay it forever. Do I think that even that $300 – if I paid $300 once or $200 once, if the laws are there, the regulations are there and they’re looking at what’s actually supposed to be the right way, which is using a licensed person, there shouldn’t even be the middleman. I don’t care if it’s $75 unless it’s your friend down the street who you’re paying for advice. Doug Hoyes: Yeah, so your biggest objection, obviously the biggest objection is you paid, or were supposed to pay 24, 25 hundred bucks. So that’s a big number. I get that. And your second biggest – I mean you used the word predatory. So what do you mean by that? Respondent: It just seems to be that – so when people are in their debt worst and they’re stressed out or like me, like anxious or you’re just trying to look at your 10-year plan or 5-year plan, you’re thinking this is never going to get paid off. You’re looking for any sort of advocate, shining light, guiding light that’s out there and these people – these organizations it seems they’re just there to give you a little boost, get you enticed, say all these things and then get you signed up, get you to sign the bottom line, talk about the payment plan, very small payments, don’t worry, stop paying your credit cards. They’re using probably the same thing you guys might say to people saying don’t worry about paying your credit cards because we’re filing a proposal but yours is for a different reason. It’s to save you money while the proposal’s going through. And then there is no monthly payment on top, on top, on top, double stacked. This one is like, we’re going to find an angle in and we’re going to get those people who are worried and then we’ll figure out the payments and then it’ll be a wash. They won’t even notice. Doug Hoyes: Yeah, when you come in to see us, when the proposal starts the rule is you can’t pay anybody because everyone has to get treated exactly the same. Everyone gets exactly the same deal. So we’re telling you to stop paying because that’s what the law says. So the day you file a proposal, no more payments. The only payments you’re making are to the trustee who then, of course, distributing the money to all the creditors. Respondent: Yeah, once it’s finished. Doug Hoyes: But it sounds like that wasn’t explained to you. Respondent: It was something in the cards because really if you hit your credit rating it’s going to go down anyway, and just stop paying it now and then sign here and we’re going to pay that $300 to me and you know, on your budget, which I do have a pretty good budget from Excel spreadsheet, you’ll see that the $300 savings or $400 savings on your payments, but you’re paying them. So it’s a wash. You don’t even notice. But luckily for me I do notice because it’s a payment I would have had to make for a year and a half. I was thinking, like, no. I’m paying my proposal off as soon as possible. And I’m getting myself a house. I can’t have these other expenses. Doug Hoyes: And so what advice would you give to people, then, who are in the position you were in a year ago or six months ago, whatever it was, where I got a bunch of debt, I got $45,000 worth of debt, there’s no way I can ever hope to pay it off based on what my income is. I’ve got no other way. I can’t sell my house because I don’t own one. I’ve got nothing to sell, there’s nothing else I can do. What would your advice be for someone in that situation? Respondent: I’d say, like, just be honest with yourself. Take the stock of what you’re at. Look at a couple of years down the road. If that’s not going to be then either go to official websites like Canada Revenue or Canada Finance, like, from the government. Or just directly to a trustee. Because you’re not going to pay loads of fees. You’re cutting out the middleman and you can be honest with the trustee and just tell them, like, I am broke. Or I’ve got so little money that even if you put through an offer at this amount, I don’t know. Like, you just got to just – I don’t know, talk to a great trustee or a good trustee in your area and just do your research and try to avoid middlemen consultants. Doug Hoyes: There you go. Try to avoid middlemen. I think that’s – and that’s probably good advice in every area. Respondent: Any way. Yeah. Like when you go buy a car, I mean you could hire consultants to buy you a car, but you’re paying them and you could have just went there yourself. It’s just – it’s a classic story of, well that. Because I think probably through history there’s been these middlemen that pop up and then the government eventually regulates, regulates, regulates, regulates, but this seems to be one spot they haven’t targeted yet. Doug Hoyes: So. Do you think the answer is the government should regulate more, or do you think the answer is what you just said, that well, do your own research and – because I mean how much can the government possibly regulate. Respondent: I mean, I think honestly think it has to be both because you can do all the research and you could be very skeptical but some people are still going to be anxious. They’re still going to make a rash decision and they’re going to go to the flashy Facebook or the flashy ad online, and they’re going to start there and by the time they ‘re in and you’ve been talked to you’re just going to – that path may continue. But I think honestly, if the government regulates, like, you know, I’m in travel now and they regulate the crap out of us and they cut out a lot of middlemen and scammers and people who take extra money for no reason. They need – they probably just need to do that to the same industry and say, like, we can’t have these people in the middle. Or regulate their fee to a low, low amount, because you have to look at the amount of work that’s actually being done comparable to the price. And it’s just astronomical. Doug Hoyes: And your perception there wasn’t a whole lot of work done. Respondent: It doesn’t seem to be because it was entering of information, calculating of his fees, and then suggesting what we could do for our proposal amount and then getting the trustee to do the rest, to do the work. So. Doug Hoyes: Now their other pitch is not only are we going to help you get a better deal on the proposal, we’re also going to help you in the future. You know, we’re going to help you rebuild and get back on track and all that kind of stuff. Respondent: But in reality they offer – they just say there’s similar secured cards out there. Sign up for this one or go apply to it. They offered Equifax subscription, which I wasn’t interested in because I do the free ones online. Doug Hoyes: And that Equifax subscription was a paid subscription? Respondent: They said they would have covered it for a year’s time, but even if you go to their site, it’s still nowhere near $2,000 for that plus there’s a ton of – on their online ones, that I even use that give you both sides, Equifax and TransUnion. So you don’t need that. And it may seem like an added perk but you’re kind of just duplicating what’s already out there for free. That’s it. Like there really isn’t an ongoing communication, there isn’t ongoing coaching, there isn’t ongoing budgeting, there’ isn’t – so you go in thinking you’re paying this amount, it becomes this huge amount. You’re thinking, okay, well maybe I’ll cross my fingers and I’ll get an amazing deal and I’ll get some after care. It doesn’t really happen. Doug Hoyes: So what they promised up front wasn’t the reality. Doug Hoyes: So, why is it these guys continue to exist then? Respondent: I just think, that, like I said, when you’re targeting people at their weakest or at their most vulnerable, people are going to look for the shining person to get them out of the mess. And maybe trustees don’t do enough advertising in that regard, or as the shining lights or the people who are going to get you out of the mess and maybe it’s just a matter of a little bit of marketing on their side, and these guys might be out of business. I don’t know. But this is what they do. They get you in the door and they praise you and then it becomes a sale of a large amount of money. Doug Hoyes: So I am a trustee obviously. So give me some advice, then. You know, you’ve been on the other side of the table. So – because I spend lots of money on advertising. I mean I’m on Facebook, I’m on the radio, I’m all over the place. Respondent: I don’t know. They just have a flashy way of doing it I think. And they promise you this and they say, you know, you’re this and you’re amazing and it’s not your fault and you know, there’s some responsibility for the customer, there’s some responsibility for the debt holders because they charge a lot of interest and it compounds. Doug Hoyes: Yeah, well I know. The Office of the Superintendent of Bankruptcy issued a report saying that in 2016, which was the year they analyzed, 20 percent of all proposals went through a debt consultant. So your situation’s very typical. The amount of money that you were charged is almost exactly what the Superintendent’s office found was the average fee, somewhere in that 25 hundred dollar range. So when you do the math, it was like $23 million in fees that people paid to a middleman. Respondent: And if you look at the value earned or the return on the investment that you would have made with that, as a customer, there’s not much there that you could have gotten from trustee at zero cost. So that savings is not realized by all the people in Canada that use these guys because that could be money in their pocket. Respondent: That’s right. It was a very tight summer for me. Doug Hoyes: Yeah and so you were maxed out on your credit cards. It’s not like you could take a cash advance and get them, so this was actual real money to use. Respondent: This is really dollars I could have used. Doug Hoyes: So your advice to me is, I’ve got to do a better job of getting the word out there. Respondent: Get the word out there and find a way to change the rules, or the laws because it’s not fair. Like I said, I’m in travel. [Antico] regulates this kind of stuff. These people don’t exist in the middle unless they’re providing a legitimate service or something tangible or whatever. So, it’s – they’re doing it for one industry, they need to do it for another one because especially with this industry when people are down in their dumps, come on. It’s really easy to take advantage or sell something, a bill of goods to people when they’re down in the dumps. Doug Hoyes: When they’re at their most vulnerable. Any final pieces of advice or words that you’d like either people who are in your situation to hear, or the government to hear on the regulation side? Respondent: Boost up the trustees because they’re the ones who did the paperwork and did the real work, and just cut the middleman out and go to a trustee. Or do your own research and maybe you can do it yourself through a bank consolidation loan if you have the capacity. Like, it’s not always you have to go bankruptcy. But you have to go to the people who are licensed and pay their dues and pay the regulations and follow the rules and you’ll get the same deal, or maybe you’ll get a better deal. My you’ll get a slightly higher deal, but at least you know it was done correctly and you’re not paying 20 million or whatever in excess fees that could have been in your pocket. Doug Hoyes: Excellent. Thank you very much. I appreciate you doing this. Doug Hoyes: Wow, so that’s quite a story but sadly, it’s not a unique story, Ted, you and I have heard a similar story hundreds of times over the years. Doug: So let’s summarize what we’ve just heard here. So what was the, the big take-away for you? Ted: It’s really easy to see how this can happen, I mean, this guy’s obviously intelligent, he did his homework and he checked everything out and he simply liked the fact that they said they were on his side. They were a consumer advocate, they were – he was looking for looking for somebody who’s going to be on his side because he already distrusted the credit card companies. The website looked good, everything was slick, they were friendly and the initial consultation was very – what’s the word I’m looking for? Doug: Well, friendly, I think. Ted: Yeah, friendly’s the right word. Doug: Yeah, yeah, I think that’s, that’s an excellent way. And, I mean, you’re right, he, he used those words that, you know, they’re on their side. Doug: And, you know, you want someone who’s on your side and obviously he didn’t trust the banks and the credit companies and all the rest of it, so. Ted: Well, and he’d done his homework so he knew about bankruptcy, he’d heard about consumer proposals and credit counselling and debt consolidation. He also thought they had some fifth option, of course they didn’t. Doug: Well, and that’s, you’re right, that’s exactly right. So, I, I think, it’s not really his fault that he got kind of, you know, sucked in, if you want to use that word. I mean, they have a fantastic sales pitch, you know, “We’re on your side” and of course they don’t make it clear what their fees are up front. And so is the fact that they don’t make clear what their fees are the biggest problem you have with them? Ted: The biggest problem is that they don’t do anything useful. Doug: Well, that’s a problem. Ted: I mean, they take the, take your information, they’ll send it to a trustee, the trustee does all the work because legally we’re required to. So that means they’re preparing the paperwork, they’re communicating with your creditors, they’re processing all of the transactions that happen during your proposal. The debt consultant makes a sales pitch to an unsuspecting individual, collects their fee and in some cases it’s many thousands of dollars, I mean, this guy paid all that money that he could have used for something else. Doug: Well, yeah, and as I said in the interview this is not just our opinion. In April 2017 the Office of the Superintendent of Bankruptcy released a report that said that in 2016 in almost 10,000 consumer proposal filings the debtor reported having paid for financial advice before being directed to an LIT and over half of those cases involved two large volume debt consultants. So it’s not little guys giving advice, it’s big sophisticated companies that have lots of money to spend on Facebook and Google ads, that’s how they attract people. Doug: This report also said that the average fee charged by the debt consultants was $2,400 which was almost exactly the fee that we just heard in the interview we just played. Doug: So, let’s do some math here, 10,000 people paying $2,400 up front for nothing, so that’s almost $24 million in fees paid to these unlicensed, unregulated debt consultants who provide no useful service. So, what’s your advice on all of that? Ted: Well, it’d be really nice if the government would do something about this. I mean, they obviously, they know the numbers, they produced the report and yet these guys continue to operate. Doug: Yeah, and I’m working on it, I’m making phone calls and doing what I can to make the government aware of this and I’m actually going to send them the link to this podcast so they can see that interview, so they can see it firsthand and, you know, frankly I think it’s pretty simple to fix. Doug: There’s a few things, the rules already exist so I think the government could fix this pretty quickly. But, well, and, and, again, let me read more from the report here. Now, I went on the internet and I looked up, we’re recording this in November 2018, there are currently 211 LIT firms and 1,049 individual LITs in Canada. So if the government has identified 13 firms and 50 LITs, it’s a small sub-set. Doug: It’s not most LITs, it’s a very tiny sub-set so I think it’s relatively easy to fix. So, we’ve already gone pretty long on this podcast and I don’t think any of our listeners want to hear what technical steps I think the government should take to fix this since it’s very technical. So let’s go back to the most important question which is what advice would you give someone in debt, how can you avoid getting sucked in by these guys? Ted: Alright, so the most important advice for anything is always know who you’re dealing with. Are you dealing with a credit counsellor, a debt consultant or a licensed insolvency trustee? Work directly with the type of advisor that provides the service that you need. So don’t take advice about bankruptcies and proposals from a credit counsellor or a debt consultant. Ted: They’re not the ones licensed to do it. Ted: And skip the middleman. It’s an easy question, when you start talking to somebody if they tell you that they’re going to have to refer you to someone else to actually complete the work it’s a pretty good sign you shouldn’t be dealing with that person. Doug: Well, and you have to be very specific in your question. Doug: “But, yeah, I’m the guy who’s going to have carriage of this all the way through.” So you got to be specific and really pin them down cause I think you got the impression from the interview that they can be somewhat evasive. Ted: Well, and they are, I mean, the – I equate these guys to payday loans and that’s a whole, we don’t want to go there. Doug: Oh, we’ve done some shows on that. Ted: They make it really easy to use their services up front and you don’t realize that the, the pitfall, the trap that you’re falling into. And, and as the evidence here shows it’s a $2,500 trap for most people and you don’t have the money to start, you’re already in trouble. Doug: And that’s, so those are the two points that, know who you’re dealing with. Doug: And know what you’re paying. Doug: And that, that pretty much will allow you to see what’s happening. So, okay, well I think that’s a, a great place to end, Ted, thanks for being here. So let me emphasize that point one more time. Only a licensed insolvency trustee is licensed by the federal government to file a bankruptcy or consumer proposal. Not a financial planner, not a credit counsellor and certainly not a debt consultant. They charge you a big fee and all they’re doing in most cases is referring you to an LIT who will actually do the work. So skip the middleman, go directly to an LIT and save a lot of money. That’s our show for today. Links to the government report I mentioned and everything else we talked about can be found along with show notes and a full transcript at hoyes.com, that’s h-o-y-e-s.com. This is a big issue so if you want to help us make the unsuspecting public aware of how these guys operate, please share this podcast with your friends. And it helps if you like the podcast if you leave a review on iTunes and we also release the video on YouTube so please subscribe to our Debt Free in 30 channel so you don’t miss an episode. Thanks for listening. Until next week, for Ted Michalos, I’m Doug Hoyes, that was Debt Free in 30.